Congratulations are in order for Samsung: The world’s most prolific smartphone manufacturer has managed to add yet another gargantuan device to its ever-increasing Galaxy lineup. The Note 3 phone-tablet hybrid naturally follows the Note II, adding a faster quad-core processor, a bigger battery, a higher-res display, and 4K video recording capabilities. The improvements are minor, but they send an important message: The Note phablet line is a success, and won’t be going away anytime soon. We’re now looking at only iterative, generational improvements as these behemoth devices settle into the Samsung lineup. The Note 3, which Samsung announced early Wednesday during the company’s IFA Berlin keynote, features a 1080p Super AMOLED display that measures 5.7 inches—just a bit bigger than its predecessor’s display, but less than an inch smaller than the display of the recently released Galaxy Mega. Users can bring up Samsung’s Air Commands with the S Pen. 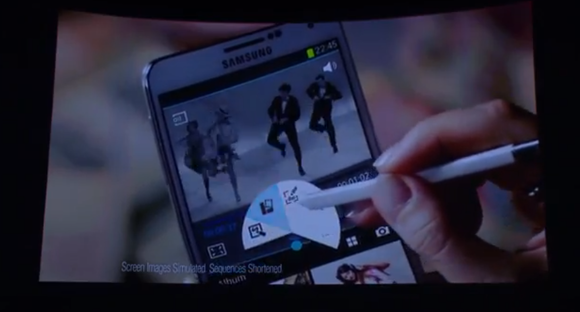 The Note 3 comes with a dockable S Pen stylus, as the Note models before it did, but Samsung has added “Air Command” features to the new device. When you hover and "click" over the screen with the stylus, Air Command brings up a circular menu that gives you quick access to Samsung’s proprietary pen apps: Screenwrite, Action Memo, Scrapbook, S Finder, and Pen Window (an app that allows you to draw a window on the screen to bring up an app you’d like to use). Most of the apps included with Air Command could be replaced with a more functional, likely cross-platform application from the Google Play store, though the substitutes wouldn’t be fully compatible with the S Pen. Samsung has clearly indicated that it intends to woo consumers with an all-inclusive package of custom apps, luring users away from the Google Play store and toward the proprietary Samsung ecosystem. Power users will appreciate the device’s quad-core, 2.3GHz Snapdragon 800 processor, which Qualcomm announced earlier this year at its CES keynote. The new system-on-chip comes paired with 3GB of RAM and the Adreno 330 graphics processing unit, which will drive the pixels of Samsung’s demanding 1920-by-1080 screen, as well as enable UltraHD 4K video recording (which captures video at twice the size of 1080p). Note that this isn’t the first handset capable of capturing 4K video; earlier this week Asus announced its 6-inch Liquid S2 handset with the same Snapdragon 800 processor and 4K recording capabilities. However, you won’t be able to view the content at its full resolution unless you have a display that’s capable of playing it back. The Note 3 comes in a variety of colors and designs. 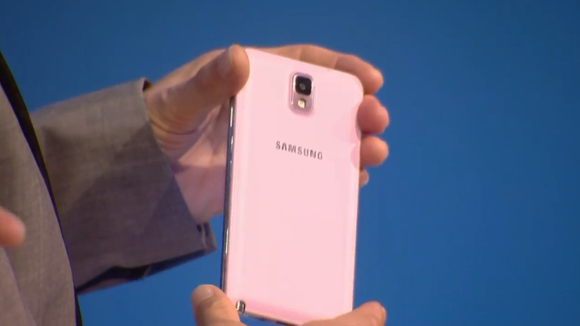 Samsung stuck with its standard curved plastic chassis for the Note 3. It will also include a leather backing that houses a 3200mAh battery pack. Photo buffs will appreciate the 13-megapixel rear-facing camera, in addition to the Galaxy Note 3’s 4K video capture abilities. 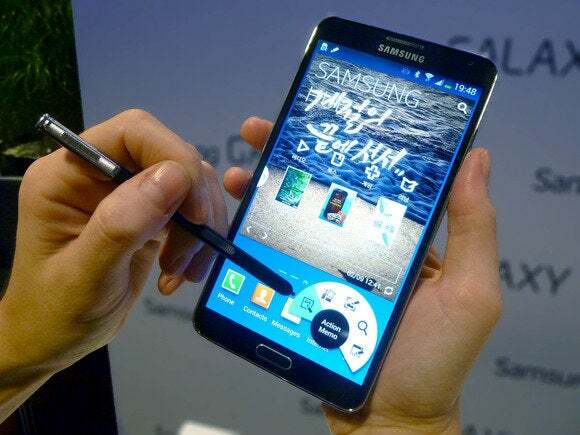 Samsung has also packed the Note 3 with Samsung Knox, a security suite that protects sensitive corporate data. On top of that, you’ll be able to use the Note 3 in conjunction with Samsung’s Galaxy Gear smartwatch. The handset will be available in 32GB and 64GB variants on September 25 in most of the world. As for the United States, Samsung says only that the device will be available “later this year” on AT&T, Sprint, T-Mobile, and Verizon. This story, "Here we go again: Samsung announces another huge phone with the Galaxy Note 3" was originally published by TechHive.